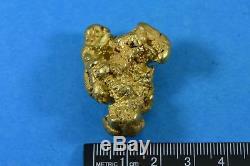 This Large Natural Gold Nugget Weighs 61.55 Grams - 1.97 Troy Ounces - Alaskan-Yukon BC Gold Raw Nugget. Length = 35 mm Width = 28 mm Thickness =17 mm. 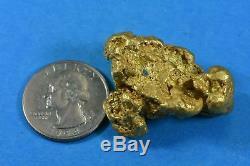 Large natural gold nuggets are very rare as a one ounce nugget is more rare than a 5 CT diamond. Natural Gold Nuggets can have other mineral content such as silver and copper mixed in with them and are never 24kt gold. Each nugget comes to us directly from the miner in an unclean state. We remove most of the dirt and rock and tumble them to bring out it's natural shine. Each nugget is filmed next to a US quarter that is 24.5MM in diameter to give you an idea of it's size. Natural Gold Nugget Mined with True Grit from the Earth direct to your living room..... Nuggets by Grant created in 1960 Innovated in 2013. Through using my resources at the world number one Natural gold Jewelry Manufacturing shop once know as Conner's Jewelers and now the company Orocal. Certificate of Authenticity-In Picture #7. 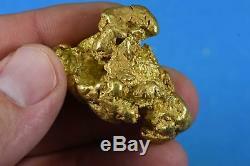 · What is a Natural Gold Nugget? It is a piece of gold that broke out of quartz deposits within the earth when erosion took place. It also goes by the name Placer Gold and each piece is a one of a kind with no two being exactly alike. · Where can they be found? Wherever the effects of erosion took place. That would include rivers, streams, ancient dried up river channels and underground riverbeds. · How pure are they? Gold nuggets range from 65 to 95 fine 16-23KT gold and can have other mineral content such as silver and copper mixed in with it. · What sizes do they come in? Gold Nuggets come in all sizes, the smaller one range in sizes from 1 millimeter up to 6 and is often referred to as flakes. Bigger flakes are called nuggets and have been found as large as 2500 ounces although almost all nuggets bigger than 300 ounces were melted. 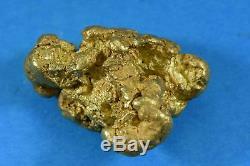 · How Are Natural Gold Nuggets found? They can be found in rivers and streams using a gold pan or suction dredges that act like an underground vacuum cleaner. Larger operations use large machinery that dig up huge sections of dirt weighing several tons and run it through machines that separate the gold from the dirt. Nuggets are also found using a metal detector. · How are they weighed? They are weighed by the troy ounces. 12 ounces = one pound which differs from weight which is 16 ounces to the pound. The troy ounces are broke up into 20-penny weight to the ounces and use the symbol DWT or by the grams which has 31.1 to the ounces. The larger the nugget the more rare and valuable they are. A one-ounce nugget is now considered as rare as a five-carat diamond. How many of those do you own? · Why are some real bright and others dull? Because it was formed underground in quartz deposit you often find quartz mixed in with it. When they broke off into the rivers and streams they tumbled against the sand and gravel, which gave the nuggets, it? S texture but dulled it. They can be cleaned in different solutions, and then tumbled in different media to give it the shine. 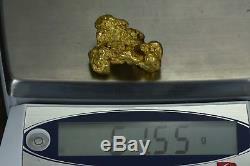 · What do we mean by My Authentic Natural Gold Nuggets under 4 grams come from two main sources. One is located near Dawson in the Yukon Territory. Skagway was where the miners of the 1898 Klondike gold rush traveled through to reach the gold fields. This is the reason I describe them as Alaskan Yukon BC Nuggets. Not all Gold nuggets are natural, some people man-make them by taking smaller gold flakes melting them and casting them into the shape of a nugget. Make sure to ask if they are genuine natural gold nuggets as found by the miners and come with a certificate of authenticity. All Nuggets are Pictured or Partially Pictured with a U. Quarter to give you an idea of Size Proportion. 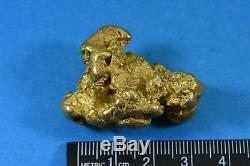 The item "Large Alaskan BC Natural Gold Nugget 61.55 Grams Genuine 1.97 Troy Ounces" is in sale since Friday, October 5, 2018. This item is in the category "Coins & Paper Money\Bullion\Gold\Nuggets". The seller is "nuggetsbygrant" and is located in Oroville, California. This item can be shipped to North, South, or Latin America, all countries in Europe, Japan, Australia.